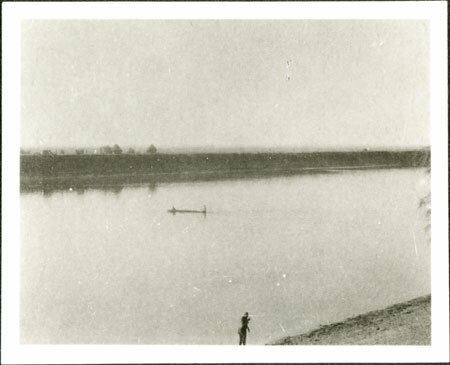 A woman on the bank and two men in a dug-out canoe can just be seen on the wide Sobat River, that empties into the White Nile near Malakal. Although the location here on the river is unknown, we know that Evans-Pritchard undertook fieldwork among the Lou and Jikany tribes in the vicinity of the river in 1931 and again in 1935. Note on print reverse ms pencil - "5 188 "
Morton, Chris. "View of Sobat River" Southern Sudan Project (in development). 03 Jan. 2006. Pitt Rivers Museum. <http://southernsudan.prm.ox.ac.uk/details/1998.346.188.2/>.